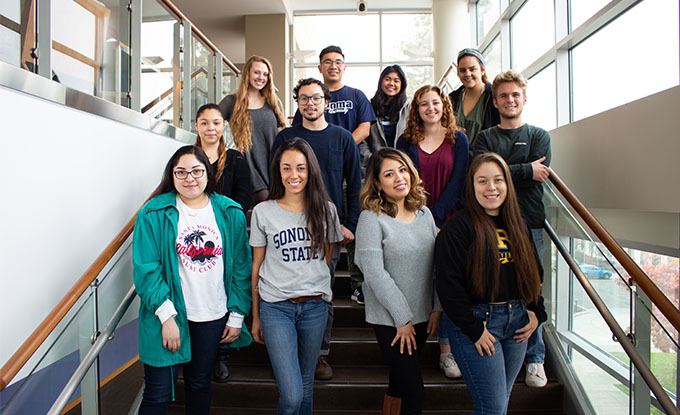 Faces of SSU is an annual project at Sonoma State University, where students are recognized for sharing their unique story, on-campus leadership and contributions to the Seawolf community. The nominated students share their story through written narratives and a photo campaign that will be displayed on-campus. These stories reflect their individuality, campus involvements and experiences while studying at Sonoma State University. This year, twenty-three students were selected to be a part of the 2019 Faces of SSU project. These students have all taken a vigorous role in upholding the Seawolf Commitment, truly embracing integrity, excellence, respect and responsibility in their day-to-day interactions with fellow Seawolves. Additionally, all the Faces of SSU students are actively involved on-campus, where each individual has served a role in the development of the University’s overall campus climate. Some programs that these students are involved in are the Filipino American Association of Sonoma State, the Accounting Forum, Multicultural and Panhellenic Greek Councils, Associated Students, Black Student Union, Summer Orientation, Summer Bridge, and many more. Faces of SSU began in 2012, with the goal of starting conversations between students. These conversations can truly connect students, shed light and embrace the diversity amongst the student population. Throughout time, the campus community has continually grown, and will continue to grow over the coming years. All Faces of SSU students were nominated by peers, staff or faculty. To be qualified, nominees had to meet certain criteria including being actively involved in the area the peer or staff or faculty member represents, and willing to share their stories and have them on display for other Seawolves to see. A committee comprised of both students and full-time staff reviewed all nominations to assist in selecting the 2019 Faces of SSU. The 2019 Faces of SSU story and photo exhibit will kick off with an Opening Reception on Thursday, April 4 at 5 p.m. in the Sonoma Valley room. Many of the students selected will be at this reception to speak more about their story and express what being a Faces of SSU and Seawolf means to them. A poster board display of all Faces of SSU students will be in the Student Center starting on April 3 until April 11, 2019. After this, Faces of SSU will be in the University Library from April 12 to May 17, 2019. In addition, banners celebrating the recipients will be dispersed throughout campus from Decision Day in April through Summer Orientation in June. For additional information about Faces of SSU and where to see the displays, please visit Seawolf Living.